Join us at 4-H Summer Camp 2019! Oconto County Youth will attend Summer Camp at Camp U-Nah-Li-Ya June 12th – 15th. Please click here to register for 4-H Summer Camp 2019. Youth who have completed 3rd-6th grades can look forward to a fun-filled summer camp adventure at Camp U-Nah-Li-Ya. 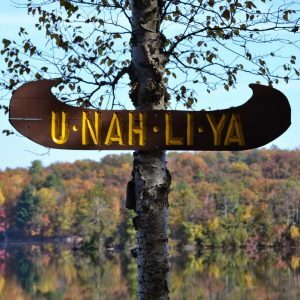 Camp U-Nah-Li-Ya is located on lovely Chute Pond and offers swimming, boating, and fishing. Camp activities include nature, recreation, art, and waterfront. At Summer Camp, you will enjoy a variety of activities from swimming to arts and crafts to recreation. Nature and the campfire are always popular, too! We have some new and exciting things planned for this year. All campers sleep in comfortable cabins. Most cabins have indoor fireplaces and common areas with room to hang out. Trained youth counselors sleep in the camper cabins with certified 4-H adult volunteers in a separate cabin nearby. A bath house, with individual showers and bathroom facilities, is conveniently located near each cabin unit. Three meals a day will be provided by the Camp U-Nah-Li-Ya kitchen staff. Meals consist of well-balanced, fresh food, prepared from scratch. A full salad bar with fresh fruits and vegetables will be available daily. The kitchen can handle any dietary restrictions your child may have. Please contact the Oconto County UW-Extension Office at 920-834-6845 if you have any questions or if you would like more information.